All you want for the holidays is for your niece to get her two front teeth, for it to be white (but not polar vortex white), and to be as Zen as a yogi while wearing cute yoga pants. Well, I don’t have a direct line to the Tooth Fairy or Mother Nature, but I do know something about maintaining inner harmony using the power of food. Add these stress-busting, energy-fueling superfoods to a meal or enjoy as a mid-gift-shopping snack and stay mentally balanced while maintaining your fab yoga figure. You can’t go wrong with a few slices perfectly ripened avocado. The texture is a mix between buttery and heavenly, and the heavy dose of vitamin B they offer perks up your alertness while taking down your anxiety levels. Try half of one with breakfast. Pair your morning cereal, organic pb and honey, or kale smoothie with a banana. Their mega-dose of potassium pumps up your energy while simultaneously reducing your blood pressure. Feeling wild? Try a fruit salad with both bananas and avocado (avocado isn’t just for guacamole anymore!). There’s something to the tradition of hitting the hay with a glass of warm milk after all. High in tryptophan, milk is a natural way to calm down and yes, fall deeply into zzz’s. Or of course, drink it fresh from the fridge – either way, it’s soothing. Tantalized by toast or riveted by rice? Don’t worry – we all are. Stick with complex carbs like whole-wheat bread and brown rise to raise serotonin levels and keep you happier than Dean Martin sipping eggnog and slurring carols. Consider eating these fish to take you to your adrenaline-free zone. The omega-3s in these fatty fish make staying calm easy. Yes, even when the printer biffed your holiday cards and your mother-in-law is writing Facebook posts about how she’s clearly been cut off of mailing lists. Zinc does a body good, and cashews are full of it. Blessed with the power of relieving stress and fighting off infections, a handful of cashews are almost as deserving of the title “savior” as someone else whose name comes up this time of year. When you’re stressed out (whether from debating about Pound Puppies vs. Pound Purries for your best friend’s kid, or from trying to cook the perfect holiday meal), your vitamin C levels drop. Grab one of these pulpy beauties to fight stress, and thus infections. Sing it with me now: serotonin! I don’t expect you to skip sweets and treats – just do so wisely with anti-oxidant rich, mood-boosting dark chocolate. Try drizzling it over orange slices for a decadent mid-day pick me up or delectable dessert. When you’re running full-steam ahead to make the Holidays happen, be sure to give yourself the gift of healthy food! Come by Intelligent Gourmet for a quick pick-me-up any time you need it. This week alone I’ve seen pumpkin-flavored breakfast cereal, pumpkin pie, pumpkin ravioli, pumpkin beer, pumpkin bread, pumpkin coffee, pumpkin donuts, pumpkin cheesecake, pumpkin biscotti, pumpkin Danish kringle, and pumpkin croissants for sale. And then there’s everyone’s favorite: Starbucks’ Pumpkin Spice Latte. I love pumpkin! This time of year, I want to put pumpkin into everything too and eat it 24-7. But here’s the problem with “pumpkin” products: Pumpkin – as in, the actual squash – might not even be in them. That Pumpkin Spice Latte? There is no pumpkin on the ingredients list. And the ingredients are not good. A Grande Pumpkin Spice Latte contains: 380 calories, 49 grams of sugar and high fructose corn syrup, Annatto E160B color, “caramel color” E150D, “natural and artificial flavors,” 240 mg of salt, potassium sorbate E202, milk, espresso, whipped cream, and – the spices you know and love with a dash of sulfites. That’s almost as scary as little girls dressing as Snooki for Halloween, am I right ladies? If you’re buying pre-packaged pumpkin products, be sure to read the nutrition labels and check to see just how far down the list real pumpkin actually is. But, for my money, I want the real thing, with all of pumpkin’s wonderful health benefits intact. Pumpkin is one of the healthiest vegetables on the planet. “Superfood” may be an overused term, but in this case, it absolutely applies. Just one cup of cooked, mashed pumpkin contains more than 200 percent of your daily recommended intake of vitamin A, and they’re packed with cancer-fighting, eyesight-helping carotenoids, contain lots of fiber, and are very low in calories. Pumpkin seeds are no slouch either – well worth the work of washing off the orange goo and roasting them in the oven after carving. They’re rich in zinc, tryptophan, and phytosterols, which lower cholesterol, boost your immune system, and even improve your mood. Even pumpkin pie spice – the blend of cinnamon, ginger, nutmeg, cloves and allspice – is very good for you. Cinnamon lowers cholesterol, ginger aids digestion, and all together, these spices present a compact and delicious way to consume antioxidants. Unfortunately, creating that delicious pumpkin pie flavor also requires a lot of sugar – but there are ways to get the Autumn flavor you love without sacrificing your health, teeth, and waistline. 1. Health-Boosting Pumpkin Spice Latte recipe: Care2.com posted this recipe that I just love – and it uses real pumpkin puree! She does recommend substituting coffee for roasted dandelion root, but the recipe will work either way. 2. Easy Pumpkin Oatmeal: Using your favorite oatmeal, include a tablespoon of pumpkin puree with pumpkin pie spice and agave syrup to the mix – and don’t forget to top it with walnuts! The good fats and fiber make this a real breakfast of champions. 3. Vegan Pumpkin Pie Pudding: GirlMakesFood blogger Alissa posted this recipe last year that uses maple syrup and almond milk with pumpkin, spice, and arrowroot (or corn starch) to create a healthy and vegan pumpkin dessert. 4. Coconut Roasted Pumpkin Seeds: Take 4 cups pumpkin seeds, 1/2 cup coconut oil, 2 Tb coconut sugar, 1 tsp cinnamon, 1 tsp ginger, and 1/4th tsp salt, and mix them together, coating the seeds. Spread the seeds on a single layer on a lightly greased cookie sheet and bake at 350F for 7 minutes. Stir and sprinkle with more coconut sugar, then bake for another 7 minutes – repeating 2 more times (for 1/2 hour total baking time). ***Try this recipe with curry powder instead of cinnamon and ginger also! 5. Pumpkin Quinoa Risotto: Sure, you could blend the pumpkin puree in with the slow-cooked quinoa for this risotto, but I love bringing some Italian flair to the recipe by using fresh wedges of cooked pumpkin instead, like this recipe does from the Times of Malta. Garnish with crispy brown butter-fried sage leaves if you’re so inclined. “Brussels sprouts? !” I hear you ask. Yes, I can sense your surprise through my computer screen, and I completely understand your distrust of Brussels sprouts. You’ve been burned before – I get that. You have a bad history with these mini-cabbages because someone in your life cooked them the worst way possible: steamed. Yes, steaming your vegetables is healthy (much better than boiling), but this method of cooking does no favors for the cabbage family – at least taste-wise. Prepare to be amazed, because I will show you TWO ways to love Brussels sprouts so much, you won’t want to have Thanksgiving without them. While the onions are browning, chop 10 Brussels sprouts in half, through the root, then slice into thin shreds. Add the sprout shreds to the pan with the caramelized onions and stir, cooking until they’re tender but still bright green. Add shelled pistachios, dried cranberries and Parmesan cheese – and serve hot! *Carnivores might like to add one slice of bacon to flavor the onions, and to crumble over the top of the finished dish. Dice 1 apple, 1 butternut squash, 1/2 brown onion, and 5 Brussels sprouts. Toss the apple, squash, onion and sprouts with 1 Tb olive oil, and add torn sage leaves, a sprinkling of salt, and pepper. Roast in a 400 degree oven for 30 minutes, stir, then roast for another 20-30 minutes until the sprouts, onions and squash are nicely browned. 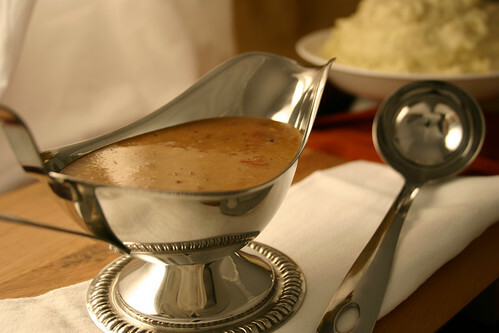 *Add croutons or wild rice and thyme and this recipe makes a delicious turkey dressing! I don’t know about you, but as soon as November hits, I feel the Holiday pounds getting ready to pounce. Thanksgiving and Winter Holiday goodies are irresistible – or are they? If you can free your brain chemistry from its dependence on refined sugars and processed carbs, it is possible to look at a delicious Thanksgiving spread without wanting to eat all of it. The secret isn’t so much self control as it is learning how to help your body work better. Blood sugar, brain chemistry and hormones all influence our abilities to make good or bad food choices – but once you understand that these physiological factors are responsible, you have the power to stay on track with your goals. If you’ve noticed that your self-control is strongest in the mornings, but by 8 p.m. your hand is in the cookie jar – that’s normal. Like any muscle, your resolve wears out over the course of the day. And, studies have shown that if you exercise self-control over too many areas of your life at once, you’ll lose it faster. Don’t try to be too “good” this year – just try to be healthy. Here are some ways to help you do that. Do a mini-cleanse – either by spending three days juicing, or even just avoiding all starches, alcohol and processed foods. The goal is to clean out your system of unhealthy fuels that spike the desire to eat unhealthy foods. Stick with vegetables, nuts, and legumes for at least three days and you’ll feel better able to say no to seconds on pie. Keep your blood sugar steady with small meals and protein-rich snacks (walnuts, cashews, almonds and pistachios are all nutrition-packed superfoods! ), since even a small dip in blood sugar can tip you over into losing control. Start off on the right foot each day by exercising first thing in the morning, followed by a “clean” breakfast (egg white omelet with spinach is one of my favorites). By lunchtime, you’ll probably want to keep the positive momentum going with a great salad. Just because the Holidays are here doesn’t mean you have to give up on your health goals – and it doesn’t mean you can’t enjoy a feast with friends and family either. You can have both! Pumpkin season is so packed with super-food goodness, I don’t know why we don’t eat pumpkins year-round. Did you know that just one cup of pumpkin contains half your daily recommended dose of fiber? It’s got antioxidants that prevent everything from wrinkles to cancer, contains more potassium than a banana, and is a great source of vitamin A and iron. Pumpkin seeds are also incredibly good for you as a source of unsaturated fats and oils, zinc, and the amino acid tryptophan, which helps your body produce the feel-good chemical serotonin. In short, pumpkins make you look better AND feel better – but don’t help yourself to seconds on pie yet. The argument against canned pumpkin is that the pumpkin goes through an intense heating process to pasteurize it for safe storage. Any cooking will, of course, destroy some of the nutrients, but considering that raw pumpkin just doesn’t taste the same (and I challenge anyone to make it into a pie-like substance), I’m going to say that it’s okay to cook this one. The canned version is usually sold with no preservatives or additives – so just be sure to look for “100% Pumpkin” on the label and check the ingredients list. Canned pumpkin is also more concentrated, which means that one cup of canned pumpkin will actually have a higher density of nutrients than 1 cup of fresh cooked pumpkin. I love making a hearty Fall soup out of pumpkin using chopped onion, vegetable broth, ginger, nutmeg, salt and pepper – and, of course, a garnish of pumpkin seeds and crispy-fried sage leaves! Saute the onions in the pot first until they caramelize, then add the ginger and nutmeg, stirring until fragrant. Add 1 can of pumpkin (or the cooked meat of 1 small cooking pumpkin) and mash it together with the onion mixture. Pour in enough broth to get the creamy consistency you like best. Add salt an pepper to taste and cook for a few more minutes to let the flavors combine. While the soup is cooking, heat olive oil in a skillet and fry a handful of sage leaves until crispy, sprinkled with a little salt. Serve the soup garnished with the crispy sage leaves and pumpkin seeds. Binge eating on Thanksgiving is as traditional as pumpkin pie, or the New Year’s resolution to lose weight. But you don’t have to feel as stuffed as a Turkey after dinner this year. You have the power to make Thanksgiving healthier and feel good about yourself the day afterwards. If you use the recipes I’ve written about this month, you can eat your fill guilt-free – and benefit from all the nutrients on the table – starting with the turkey and gravy. Two days in advance: Take all ingredients (except the turkey) and add them to a large stock pot. Cover and bring to a boil. Reduce heat and simmer, covered, for 30 minutes. Allow to cool, and refrigerate. One day in advance: Remove giblets from turkey and set aside. Rince the bird under cold water and pat dry. Add the turkey to the refrigerated brine and allow to sit for 6 hours. The night before: Remove the turkey from the brine, pat dry, and return to the refrigerator overnight. This dries the skin so it will crisp. Thanksgiving Day: Preheat oven to 550. 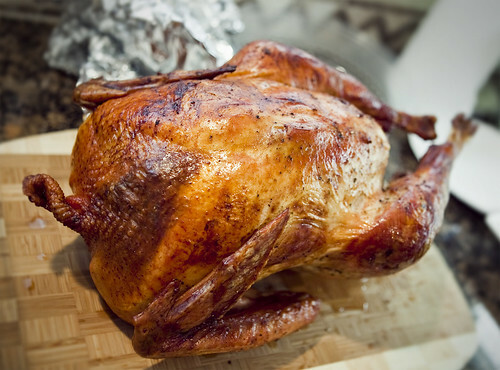 Rub the turkey inside and out with the olive oil & herb turkey rub. Put the turkey in the oven for 30 minutes, then cover the breast with aluminum foil and replace in the oven. Reduce oven temperature to 350 and bake until juices in thigh run clear and breast meat reaches 165 degrees with a meat thermometer. Let the bird rest for 20 minutes before slicing. Why it’s crazy-good for you: Turkey is such a healthy meat – high in protein, low in fat, and an excellent source of amino acids. And, did you know Tryptophan is an anti-depressant? White meat or dark meat? White meat may be lower in fat and calories, and higher in protein, but dark meat has higher levels of Zinc, iron and thiamine. One choice is not automatically better for you than the other! Here’s the breakdown (1 serving = 3.5 oz). Calories per serving: White meat contains 161 calories. Dark meat contains 192 calories. Fat per serving: White meat contains 4 grams. Dark meat contains 8 grams. Protein per serving: White meat contains 30 grams. Dark meat contains 28 grams. Iron: White meat contains 1.57 mg. Dark meat contains 2.4 mg.
Zinc: White meat contains 2.08 mg. Dark meat contains 4.3 mg.
Thiamine: White meat contains .04 mg. Dark meat contains .05 mg.
Riboflavin: White meat contains .13 mg. Dark meat contains .24 mg.
Selenium: White meat contains 32.10 mcg. Dark meat contains 40.90 mcg. Folate: White meat contains .01 mcg. Dark meat contains 10 mcg. If making from your own turkey broth, skim off any visible fat from the pan juices. Whisk ½ cup turkey stock and tapioca starch in a small bowl until smooth and set aside. Set the roasting pan over two burners on medium-high heat. Add cider and vinegar, and bring to a boil, scraping up browned bits from the pan. Boil until liquid is reduced by about half. Add the remaning 3 ½ cups stock and pour the reserved flour mixture into the pan. Boil, whisking constantly, until the gravy is thickened. Remove from heat and pour the gravy through a fine sieve. Season with salt and pepper. Why it’s crazy-good for you: In several studies, vinegar has been linked to lowering glucose levels and evening out blood sugar, which means that even though you’re eating a lot today, you won’t up-end your brain chemistry completely tomorrow. 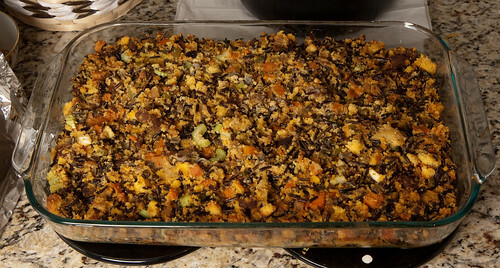 Forget the turkey, just let me eat the stuffing! It’s the best part of the bird, isn’t it? But, packed with bread and butter, it’s not the best thing for you – until now. My gluten-free Wild Rice Chicken Sausage Dressing has all the flavors you love, and is packed with B-vitamins. Feel free to experiment with variations, like adding chunks of apple, celery, or butternut squash. Saute the onions, garlic and dried fruit in the olive oil until onions are tender. Add the rice, chicken stock and chicken sausage. Bring to a boil and continue to boil until rice becomes level with liquid. Once rice and liquid are level, cover and simmer for 10 minutes. *To make vegetarian, use vegetable stock in place of chicken stock and a cup of beans in place of chicken sausage. 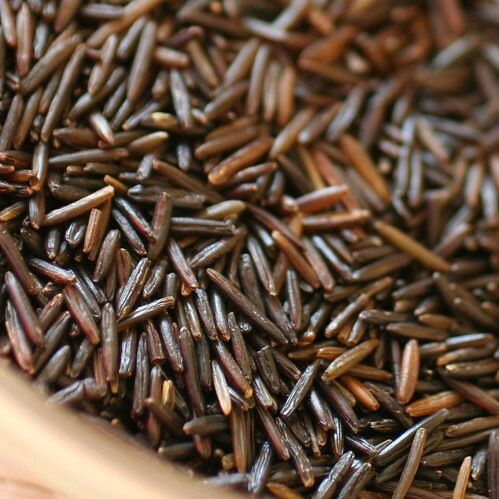 Not only does this North American native plant harken back to the pilgrim days, wild rice has far more protein, minerals, B vitamins, and folic acid than other grains. It is high in carbs, but is only 83 calories in ½ cup of cooked rice. *This is a WanderFood Weds post. A golden-brown turkey is a sight to see, but I confess – my favorite part of Thanksgiving is the side dishes: casseroles and stuffing, sweet potatoes, and mashed potatoes with gravy. This week, I’ll take two of my favorite unhealthy sides and teach you how to turn them into feel-good food. 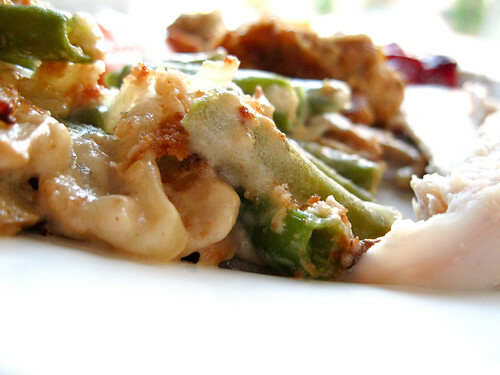 Rich, creamy, and delicious, green bean casserole topped with fried onions is one of my guilty pleasures. Here’s our healthier version from the Intelligent Gourmet kitchen. Preheat oven to 350 and lightly butter a deep 2 ½ quart baking dish. Trim the green beans and halve crosswise. Bring a saucepan of salted water to a boil over high heat. Add the green beans and cook until tender, but crisp, about 4 minutes. Bake until the liquid is bubbling, about 20 minutes (or 30 minutes if it has been refrigerated). Cut the remaining 3 shallots crosswise into slices 1/8th of an inch thick, and separate into rings. Place the remaining 1/3 cup flour in a small bowl. Toss the shallot rings in the flour to coat evenly, shaking off the excess. Roast in the oven until golden brown. Remove the casserole from the oven, scatter the roasted shallots on top, and serve. 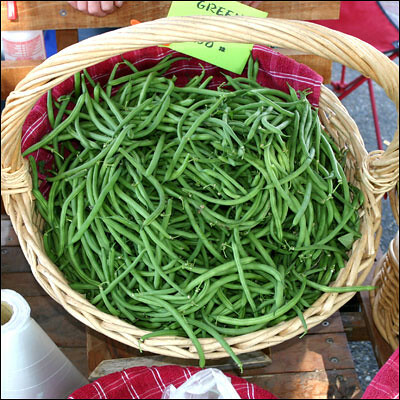 Green beans are some of the healthiest veggies you can eat, packed with Vitamin K (helps with healing and calcium absorption), Vitamin C (boosts immune system), Manganese (relieves symptoms of osteoporosis, osteoarthritis, and PMS), and Vitamin A (guards against wrinkles and age spots). While other nutrition and fitness blogs are probably giving out tips on how to avoid the upcoming eating frenzy at all costs, I have just three words for you: Go for it. If that means making imperfect food choices, like grabbing seconds on that creamy green bean casserole topped with fried onions, well fine. I’ve even heard of dieters deciding to devote their entire day’s allotted calories to pie – and only pie. It’s Thanksgiving and if you need permission to enjoy all the goodies that you are blessed to have on your table, I give it to you. However, our specialty at Intelligent Gourmet is taking the foods you love and making them healthier for you. So if you’d like to give thanks and feel great this holiday season, try this recipe to start off the festivities. Fill each Radicchio leaf with a little blue cheese and drizzle with agave. Top with 3 almond slices. Radicchio is high in antioxidants, especially dark red radicchio, which neutralize free radicals and fight cell damage. Its high fiber content promotes weight loss by helping make you feel full, and it also contains inulin, which helps regulate blood sugar levels. Although honey would be delicious for drizzling, agave syrup has a far lower glycemic index and won’t spike your blood sugar. Stay tuned, because next week I’ll give you side dishes, and the week after: the best turkey you’ve ever tasted!